Over the last five months we’ve published forum pieces by five people running to be your Member of Provincial Parliament in the newly formed riding of University-Rosedale: Jessica Bell (New Democratic Party), Daryl Christoff (New People’s Choice Party of Ontario), Jo-Ann Davis (Ontario Liberal Party), Tim Grant (Green Party of Ontario), and Gillian Smith (Progressive Conservative Party of Ontario). Now, in our final issue before the provincial election on June 7, we’re publishing their answers to questions we received from local residents’ associations and BIAs. Answers have been edited for style and length. You can read the candidates’ forum pieces on our website, gleanernews.ca. What will your party do to address the severe shortage of affordable rental housing in major urban areas like Toronto? Jessica Bell: Andrea Horwath and the NDP have committed to funding the province’s one-third share of repairing social housing across Ontario. We will build 65,000 new affordable homes over the next decade, and provide the co-op housing sector with $3 million to seed co-op bid development. We will maintain rent-geared-to-income and rent supplements and overhaul the government’s inclusionary zoning regulations, so they actually accomplish what they set out to do: require a certain number of affordable homes in new housing developments. 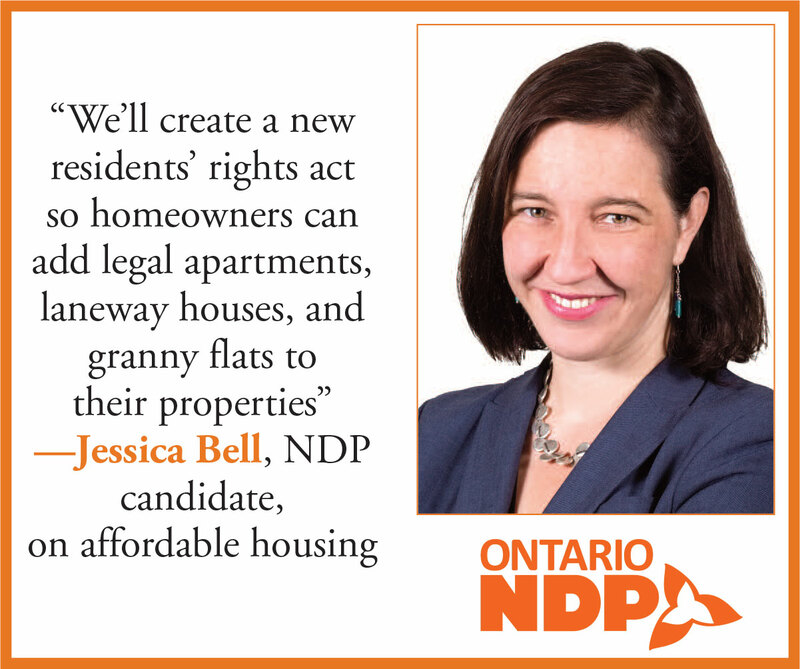 We will encourage an array of options for housing, and working with municipalities, we’ll create a new residents’ rights act so homeowners can add legal apartments, laneway houses, and granny flats to their properties. Finally, we will crack down on housing speculators who are driving up housing costs. Daryl Christoff: Revitalizing and rehabilitating locations and looking to maximize use of the space that we have is essential to ensuring [there is sufficient] affordable housing. New development should not only be required to match previous affordable housing units, but consideration needs to be included at neighbourhood levels alongside with greenspace, community space, education, and healthcare infrastructure. These locations need to have accessibility integrated with normal priced housing in places where community can be promoted. Jo-Ann Davis: Liberals are boosting affordable housing through inclusionary zoning, which calls for affordable housing units to be included in new condo developments. Through this planning tool, cities will be able to create inclusive, accessible communities that will help increase the supply of affordable housing. Before the recent expansion of rent control, tenants who lived in apartments, condo units, and houses built or first rented on or after Nov. 1, 1991 were exempt from rent control protections. These tenants faced unpredictable, arbitrary, and sometimes massive rent increases, with many forced out of their homes. Inclusionary zoning and a rent control framework that provides stability and predictability for renters and landlords is part of the mix of affordable housing solutions needed. 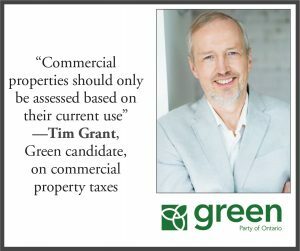 Tim Grant: The Green Party would strengthen Ontario’s inclusionary zoning legislation to ensure that a minimum of one in five new housing units is affordable, whether in new condo or apartment buildings or in single family developments. We would provide incentives to municipalities to prioritize mixed-use, medium-height buildings on main streets while at the same time protecting the interior of established neighbourhoods. In addition, we would update zoning laws to allow tiny homes, and more secondary suites and laneway housing. Finally, we would work with the federal government to increase support for new and existing non-profit and co-operative housing. Gillian Smith: There is a lack of supply in Ontario’s rental market — specifically in the Greater Toronto Area — and we know this is a real challenge for families in our riding and beyond. The best way to bring down rental costs is by increasing supply. We are in favour of reducing red tape and increasing supply to address this need and we’ll do so without touching the Greenbelt. No one should have their rent increased by 300 per cent overnight, but we need to balance this with a system that encourages new rental properties to be built. The Auditor General has determined that the provincial government’s finances are worse than reported. If elected, how will you promote financial transparency, fairness, and openness for the Ontario taxpayer? Christoff: Government accountability is at a low. 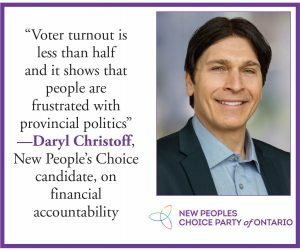 Voter turnout is less than half and it shows that people are frustrated with provincial politics. By creating easily accessible sources for taxpayers to understand government spending and simple ways to actively provide opinions on non-partisan facts, we can make people feel more engaged. When people are more engaged they can help to hold the government more accountable. The people [would] be more likely to respect the words of the Auditor General and demand that the government maintain its fiscal promises. Davis: I am committed to openness and transparency and truly believe that people in Ontario have a right to know how their dollars are being invested. As trustee, this was one of my lasting contributions to the Toronto Catholic District School Board, as I worked collaboratively to build a governance framework that promotes greater public transparency in the decision-making process at the board. The Ontario Liberal government was the first government in Canada to pass legislation like the Fiscal Transparency and Accountability Act. It’s a great building block for further systemic reforms that support public transparency and accountability. Grant: The first step is to establish financial transparency. To that end, Greens support the creation of an open data portal where a broad range of government data would be available to citizens to assess and use for data analysis. This data would include government contracts and expenses, road traffic information, and environmental reports. This would reduce the number of freedom-of-information requests. In the meantime, we would ensure that such requests are answered promptly and without political interference. In addition, we would cap executive salaries in the public service to double the premier’s salary. Smith: We are going to restore responsibility, accountability, and trust in government. We want the people of Ontario to have the whole truth about what’s going on in government because Kathleen Wynne is not telling you the whole truth. This is why we will call a commission of inquiry to get to the bottom of Kathleen Wynne’s billion-dollar hidden deficits and propose solutions to the largest financial scandal in Canadian history. We will also go line by line through the government’s finances to make sure we are getting value for money and we will restore the Auditor General’s power to monitor government advertising. The people of Ontario have been lied to and taken advantage of for far too long. Bell: Ontarians deserve politicians and leaders who will behave with integrity and transparency. Andrea Horwath and the NDP will bring in a strong MPP code of conduct, with regular updates in plain language so all Ontarians know what is expected of the people they elect. We will return full, independent oversight of Hydro One to the eight independent offices. We will work to increase government transparency and public access to information, while protecting the privacy of Ontarians and eliminate costs for freedom of information requests. And we will ensure true independent oversight of Ontario’s health care by bringing it under the oversight of the Ontario Ombudsman. What will your party do to correct the funding formula for schools to ensure a safe, healthy environment that is conducive to learning and working? 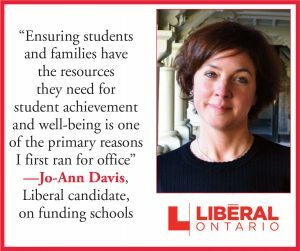 Davis: As a local school board trustee and a parent, ensuring students and families — especially the most vulnerable — have the resources they need for student achievement and well-being is one of the primary reasons I first ran for office. The Liberals have invested more in education than ever before — leading to historic increases in student achievement and high school graduation rates. Even with this investment, I know firsthand that school boards are facing maintenance backlogs. I’ve supported the Fix Our Schools campaign for some time and believe we should revise the funding formula to ensure that it’s transparent and equitable, given the differing age and states of repair of schools across our province. In addition, we should expand the ways in which education development charges can be used by school boards to include school renewal, retrofitting, and additions. Grant: We would merge the publicly-funded Catholic and public school systems, creating annual savings of $1 billion that could be used to reduce class sizes and repair school buildings. It is time to have kids of all faiths and no faith growing up together. Reducing class sizes and fixing old buildings would result in a better classroom experience for our kids, and thus better learning outcomes. Smith: An Ontario PC government will make sure that students have a safe place to learn and teachers have a safe place to teach. When only half of our Grade 6 students are meeting the provincial standard in math, it is clear there is a problem. We need to support our teachers with comprehensive and practical curricular documents. An Ontario PC government will revisit curricular documents in all core subject areas and make changes to ensure that our kids are being provided with the building blocks they need to succeed in the workforce, post-secondary levels, and life. 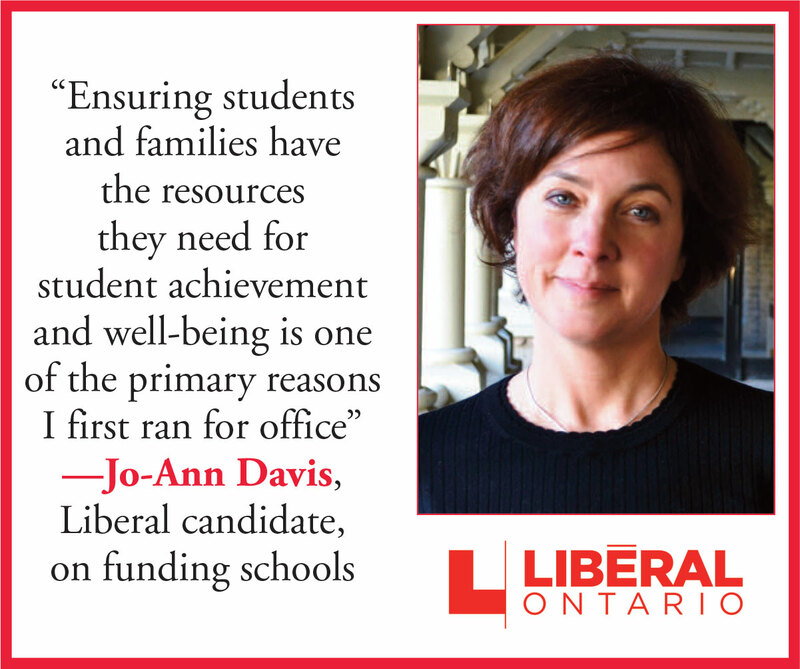 Ontario’s education system should be a force to be reckoned with. I want to see children from hard-working Ontario families ranking in the top percentiles of international education rankings. Bell: Andrea Horwath and the NDP will fund schools properly. We will work with parents, front-line educators, students, and educational experts to overhaul the education funding formula starting with a comprehensive public review based on two key principles: equity and quality. A new funding formula will address violence in classrooms, and will mean boards, teachers, and education workers have the resources they need to ensure the well-being and safety of all learners, and all educators. We will also end standardized tests and work collaboratively with educators to determine how random sampling could support spotting early trends and deciding where we should focus on improvement, without driving teachers to “teach to the test”. We estimate this will save $40 million, which we will reinvest in the classroom. Christoff: The issues facing our education systems are numerous. The necessities required for all children need to be considered. Fundraising that covers gaps for some families leaves other students with less. We need to reallocate our systems to promote optimization and remove some of the power from unions and place the focus on the needs of children along with what their parents see is needed. What will you do to ensure the Municipal Property Assessment Corporation (MPAC) incorporates the current use of a property and the city’s density restrictions on development when assessing commercial properties? 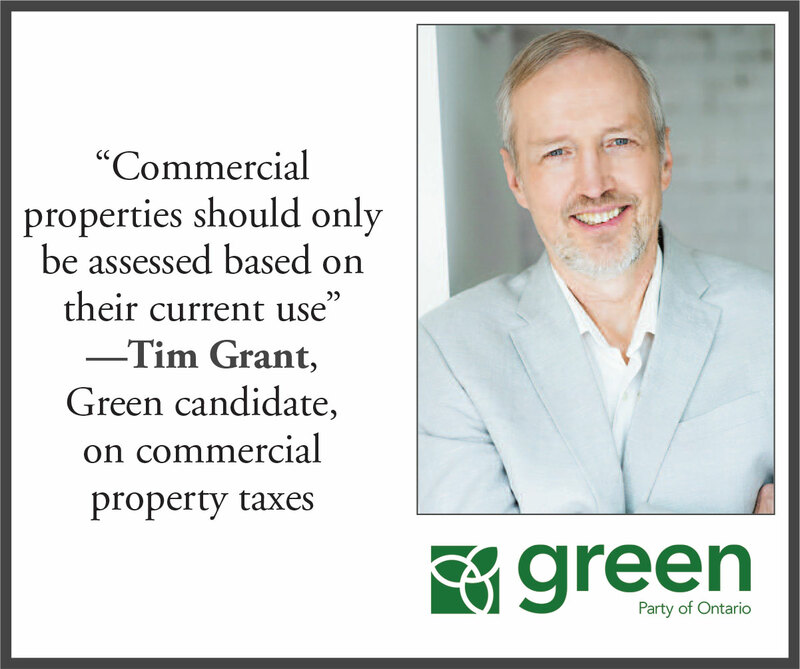 Grant: MPAC’s policy of assessing taxes on commercial properties on the basis of their highest and best use has been devastating to independent businesses on Toronto’s main streets. Most don’t own the property where their stores are located. When MPAC decides that a property could be replaced with a high-rise condo, these businesses have faced big tax increases. This is unfair. Commercial properties should only be assessed based on their current use. Smith: An Ontario PC government will put taxpayers first. Bell: The Ontario NDP has been calling for MPAC reform for years. Under the Conservative and Liberal governments, MPAC has created needless uncertainty by assessing commercial properties not based on the actual value of the business, but on the value of the imaginary condo tower that might stand in its place. The NDP will conduct a full review of MPAC and the Assessment Review Board to ensure that commercial and industrial property tax assessments are fair, reasonable, predictable, and consistent. Christoff: Community watchdogs and municipal leaders need to be brought into any development to ensure that it is enhancing a neighbourhood and not steamrolling it. Our communities have been developed over decades and should be considered as one of the infrastructures to accommodate when a neighbourhood faces change. Davis: I’ve heard first hand from residents and local business owners about the impact of assessments to our neighbourhoods and local business. It’s a system that needs to be fixed, and fast. Many have suggested that assessments should be based on actual use rather than market fluctuations in rent or best and highest use. MPAC must work with both provincial and municipal partners to ensure properties are assessed in a way that is fair and predictable so that no one is caught off guard in property valuations. In 1992, Canada signed the United Nations Convention on Biological Diversity, committing to protect 17 per cent of our lands and waters by 2020. Ontario has only protected 10 per cent. What will you do to ensure that Ontario contributes more to land and water protection in Canada? 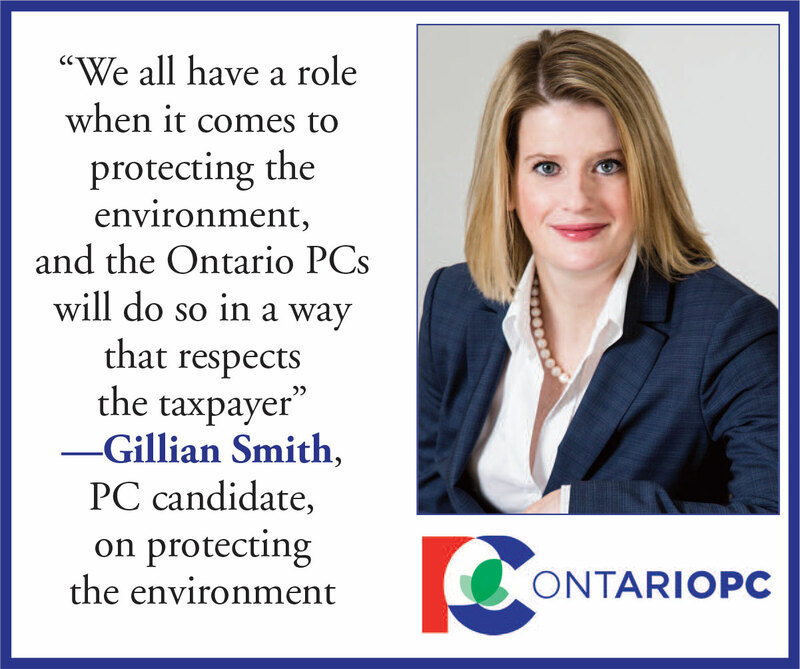 Smith: We all have a role when it comes to protecting the environment, and the Ontario PCs will do so in a way that respects the taxpayer. Bell: We believe water is a public trust, and an Ontario water strategy will prioritize planning for water needs now and for future generations, based on the public interest and sustainable public access to water. The Ontario water strategy will be based on the principle that the public should have access to water for drinking, sanitation, and food, and ensure that communities have water for planned sustainable growth. The strategy will create an inventory of water use and return across the province, prioritizing sustainable long-term water use planning. Christoff: Our built ecosystems provide our clean air, water, and food. All water bodies should be safe, but pushing to protect 17 per cent of our land should be a minimum. We believe 25 per cent of land and water in Ontario should be protected to ensure our large ecosystems and biodiversity are protected for today and our future generations. Davis: Ontario has committed to supporting a coast-to-coast-to-coast network of nationally protected land and water and as MPP I would do what I could to see that this commitment is met. A Liberal Government would continue to build on its record of environmental protection by expanding the Greenbelt into ecologically sensitive areas like the Waterloo and Paris/Galt Moraine complex, the Orangeville Moraine, the Oro Moraine, and the Nottawasaga River corridor, as well as additional wetlands and small moraines in Dufferin and Simcoe counties. Grant: Greens would set aside a minimum of 17 per cent of the land base in protected areas according to the internationally-agreed-upon Aichi biodiversity targets. In support of this, we would establish a rigorous biodiversity monitoring and reporting program as an early warning system of species loss. We would freeze urban boundaries now to stop sprawl and expand the Greenbelt to protect a “Bluebelt” of significant hydrological and ecological areas. And we would invest in the monitoring and protection of the Great Lakes. Finally, we would significantly raise royalty rates paid by companies that extract aggregates, ground water, and minerals. This would ensure that Ontario fully recovers the costs of monitoring and managing these essential resources, while providing companies with a financial incentive to prioritize conservation.